Just order by midnight to get your new phone the very next day! Where do I use my O2 voucher code? Check out the Like New Section to get a great monthly rate on popular handsets, that have been refurbished and come with a 12 month warranty. 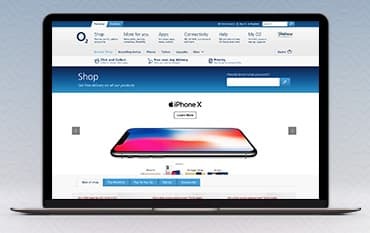 O2 are one of the biggest and brightest phone networks in the UK, and through the O2 online store, you’ll find great offers on mobile phones, contracts, tablets and much more for personal and business use. O2 have the latest models of mobile phones from the world’s foremost manufacturers like Apple iPhone, HTC, BlackBerry, Nokia, Samsung, Sony and LG among others, available on Pay Monthly and Pay as you Go contracts alike. There’s also offers on refurbished phones, great deals on slight seconds and a range of 4G phones to take advantage of the latest development in network connectivity. Compare models easily with their comparison tool and find all of the features and specs you need on your mobile phone. You’re in the right place for a new tablet too, with low-cost data tariffs to get you online for next to nothing, and plenty of accessories like cases and headphones to compliment your tablet and mobile too. Whether you’re switching to a different tariff, looking for a new phone or are just after a SIM card, visit the O2 Shop and find everything you need. With My O2 you can manage your account 24/7. Check your bill and usage with My O2 if you're on a pay monthly contract, view your balance and usage and top as you need with a pay as you go SIM's and add Bolt Ons and more all with My O2. Once you have an account with O2 you will receive all these features of a My O2 account when you log in via their website. With My O2 you'll also be notified when you're able to upgrade and have the option to enter competitions to win bundles and extras for your mobile or tablet. If you're having trouble with your account, bill or plan you can also seek help and advice from the online guru or visit help and support online where you're bound to find the answers to all your mobile problems. Upgrade after 12 months with O2, at no extra cost and never miss out on the latest phone. Get a new Samsung Galaxy S8 on O2's 10GB tariff and above, or a new iPhone 7 on their 20GB tariff and above, and after 12 months they'll upgrade your phone for free. So you won't have to miss out on each new phone that comes along. O2 Refresh splits your Pay Monthly bill into two parts. The Device Plan is the cost of your phone or tablet, and Airtime Plan is the cost of your data, texts and minutes. Just trade in your existing phone after 12 months on selected tariffs, and they'll pay off your remaining Device Plan. So you’ll have the freedom to get that new phone when you want it. With this Upgrade Programme from O2, you can enjoy all the latest in tech and mobile, stay up to date all for nothing! Delivery of all our devices, sims and accessories is free to all UK addresses. Order before midnight Sunday to Thursday to receive your device the next working day. Alternatively you can click and collect to pick up your order from your local O2 store. Collection times will vary depending on stock availability. If you are able to be home all day you can opt to pay for premium delivery and choose a time of day to suit you. Most queries can be dealt with by using the help page on the website. O2 is the commercial brand of Telefónica UK Limited and is a leading digital communications company with the highest customer satisfaction for any mobile provider according to Ofcom. With over 25 million customers, O2 runs 2G, 3G and 4G networks across the UK, as well as operating O2 Wifi and owning half of Tesco Mobile. O2 has over 450 retail stores and sponsors The O2, O2 Academy venues and England Rugby. Shop from the O2 Shop and discover mobiles and devices as well as monthly plans and SIM's all for great costs. Enjoy the O2 Upgrade Programme, keep on track with your My O2 account and save money on your mobiles and purchases with our O2 voucher codes and deals.